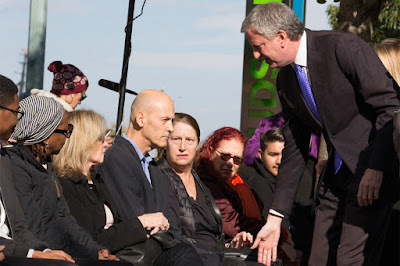 Nicholas Stix, Uncensored: Communist New York City Mayor Bill de Blasio Holds Secret Memorial Commemorating Victims of Islam that Some Survivors Couldn’t Attend, Thanks Politicians Present by Name, While Not Naming Victims, or Their Family Members; but One Attendee Put de Blah Blah Blah in His Place! Communist New York City Mayor Bill de Blasio Holds Secret Memorial Commemorating Victims of Islam that Some Survivors Couldn’t Attend, Thanks Politicians Present by Name, While Not Naming Victims, or Their Family Members; but One Attendee Put de Blah Blah Blah in His Place! "Hugh Hales-Tooke, a family friend of bike path victim Nicholas Cleves, refuses to acknowledge Mayor Bill de Blasio reaching out to shake hands"
Sent: Thu, Nov 1, 2018 11:38 a.m.
At the New York Post. Go away commie! Just go away. I never did like that shaking hands stuff anyhow. Politician glad-handing.